Called "America's best-selling chair" (as of 2010), the Aeron combines distinctive looks with pioneering ergonomics. It adapts naturally and adjusts precisely to fit people of all sizes. Providing superior comfort and body support, the Aeron offers style that is widely copied but never matched. 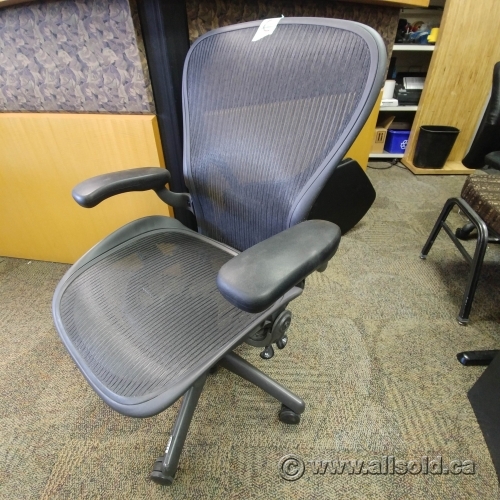 This long-term work chair is a great computer chair, general office chair, and perfect for casual or formal meetings. - Tilt limiter and seat angle allows the person sitting in the chair to adjust the tilt tension, select the tilt range (4 settings) and select the seat angle (horizontal or 5° forward).